Friability testers are used in by the pharmaceutical industry to test the abrasiveness of tablets prior to packaging and distribution to retailers. Friability testers (or abrasion drums as they can also be known) are either one, or two, spinning drums that sit on a rotating axel. When using friability testers, lab analysts place the tablets inside the drum, which then spins around, tumbling the samples continuously. At the end of the test, the tablets are removed from the abrasion drum and signs of damaged are inspected, and the batch is weighed. If any discrepancies or severe damage is detected, the test is considered a failure. If no damage is evident, then the samples are declared strong enough for packaging and transit, and the test is recorded as passed. Friability testers can be set to spin by RPM or runtime, and are often set at speeds between 20 and 100 RPM per test cycle. Friability testers are a staple of most analytical labs and are an essential test phase for all solid dose drug forms that are consumed by the public. 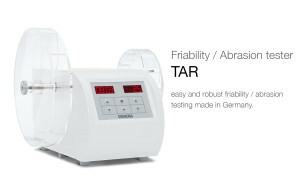 Total Laboratory Services Ltd are the exclusive UK supplier of robust, handmade ERWEKA friability testers and other high quality lab machinery, direct from Germany. We can supply a range of analytical lab equipment to suite your every need. Click here to view our range of Friability Testers and abrasion drums.